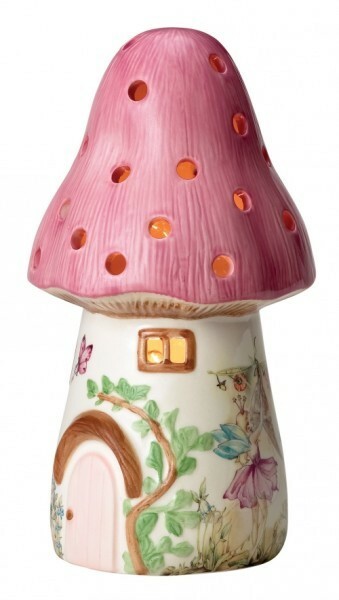 Our Dewdrop toadstool lamp is designed by White Rabbit England and is based on a traditional style light from the 1970's. It is made in earthenware with handpainted accents. The light glows from the inside through the holes and windows, giving off a reassuring light as little ones sleep. Around the lamp are beautiful illustrations of Dewdrop the fairy hanging out her wings with her woodland friends. 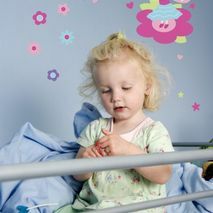 Children will enjoy switching it on at bedtime so they can sleep soundly and will treasure it for ever. Children can wake in the night many times and will often simply go back to sleep if they are reassured by a gentle light and can see their familiar surroundings. Our lamps do just that and as such replace the need to leave on the landing light!